A contract (Number 1799) was awarded in 1951 to "Metropolitan Cammell" for the construction of 240 open goods wagons which were classified "GB" and allocated road numbers "887" through "1126". 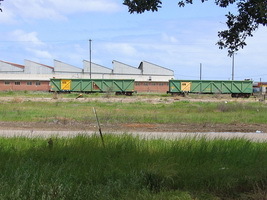 A number of the wagons where assembled by the Commonwealth Railways as "RGB" class flat wagons prior to intially entering service. 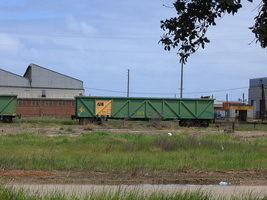 During 2005-2006 a total of 70 wagons converted from the "AOKF" class to the "AOPY" to supplement the iron ore wagon fleet between the Western Australian Koolyanobbing mine site and Esperance. 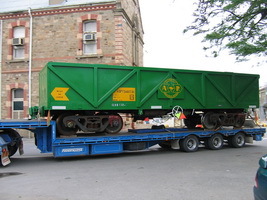 This involved the wagons being shortened in length by 3m and being modified, as well as being painted in a green livery. The modified wagons were all given new road numbers in the Western Australian Numbr list range of "32371" to "32410" and "34073" to "34102". 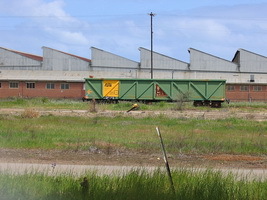 The converted wagons had all been built by the Commonwealth Railways for use on the coal traffic between Leigh Creek and the Port Augusta Power Station. They were withdrawn from use in January 1999 when ARG lost the coal haulage contract to Freight Corp.
Open goods wagon, built by "Metropolitan Cammell". 22.7.1955 Entered service as "GB" open goods wagon. - Converted to flat wagon with generator set, coded "AZGY". 18.8.1955 Entered service as "RGB" flat wagon, ordered as "GB" open goods wagon. 12.8.1954 Entered service as "GB" open goods wagon. - Converted to "RGB" flat wagon fitted with high sides for "wine traffic only. - Fitted with a generator set, coded "AZGF". - Converted to "AQFY" container flat. 13.11.1955 Entered service as "RGB" flat wagon, ordered as "GB" open goods wagon. 18.10.1954 Entered service as "GB" open goods wagon. 13.6.1973 To "GHA" coal wagon. 5.8.1955 Entered service as "GB" open goods wagon. 22.8.1955 Entered service as "RGB" flat wagon, ordered as "GB" open goods wagon. - Fitted with generator set and recoded "AZGF". 10.5.1972 To "GHA" coal wagon. 28.9.1955 Entered service as "GB" open goods wagon. 29.6.1954 Entered service as "GB" open goods wagon. 27.7.1955 Entered service as "GB" open goods wagon. 28.6.1954 Entered service as "GB" open goods wagon. 8.7.1977 To "GHA" coal wagon. - Converted to "GHA" coal wagon. - Converted to flat wagon, recoded "AZGY", fitted with generator set. 13.6.1956 Entered service as "GB" open goods wagon. 9.11.1955 Entered service as "GB" open goods wagon. 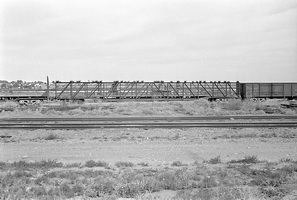 2.1978 To "GHA" coal wagon. 19.9.1955 Entered service as "GB" open goods wagon. - To "GHA" coal wagon. 12.10.1955 Entered service as "GB" open goods wagon. 11.3.1958 Entered service as "GB" open goods wagon. 6.10.1955 Entered service as "GB" open goods wagon. 9.2005 Tender called for disposal ex Islington Workshops. 26.5.1955 Entered service as "RGB" flat wagon, ordered as "GB" open goods wagon. 1.9.1955 Entered service as "GB" open goods wagon. - Converted to flat wagon with generator set coded "AZGY". 9.9.1955 Entered service as "GB" open goods wagon. 6.2.1975 Converted to "GHA" coal wagon. 7.3.1958 Entered service as "GB" open goods wagon. 3.11.1955 Entered service as "GB" open goods wagon. - Converted to container flat, coded "RGB". - Fitted with generator set and recoded "AZGY". 30.9.1955 Entered service as "GB" open goods wagon. 2.1964 Converted to "GH" hopper wagon. 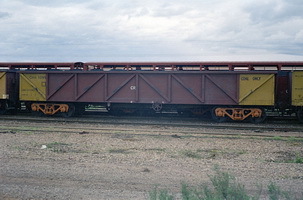 2.1976 Converted to "GHA" coal wagon. 21.11.1955 Entered service as "GB" open goods wagon. 26.2.1958 Entered service as "GB" open goods wagon. 6.9.1955 Entered service as "GB" open goods wagon. 31.8.1955 Entered service as "GB" open goods wagon. 31.11.1955 Entered service as "GB" open goods wagon. 17.10.1955 Entered service as "GB" open goods wagon. 15.6.1955 Entered service as "RGB" flat wagon, ordered as "GB" open goods wagon. 17.7.1969 Converted to "RGB" welded rail rake. 3.7.1974 Converted to "GHA" coal wagon. 10.6.1955 Entered service as "RGB" flat wagon, ordered as "GB" open goods wagon. 9.7.1964- To "GB" hopper wagon for coal traffic.